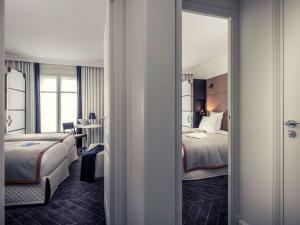 The Mercure Paris 17ème Saint Lazare Monceau is situated in Paris's chic Batignolles district and offers fully air-conditioned, modern accommodation and easy access to all of the city's main sites and attractions. Free Wi-Fi access is available throughout. The guest rooms are contemporary and refined. They are well-equipped with all that you may need for a comfortable stay, including a flat-screen TV with satellite channels, a courtesay tray, minibar, tea and coffee facilities and an elegant marble bathroom. Start the day with the tasty buffet breakfast before work or sightseeing. The Mercure is close to all the major business districts, including the Palais des Congrès exhibition centre, and to Saint-Lazare train station. The Metro is a stone's throw away from the hotel. Visit the Louvre, shop in the famous department stores and stroll in the nearby Monceau Park. The friendly and efficient staff will help you make the most of your stay 24 hours a day. A public car park can be found within 100 metres. This double room has a tea/coffee maker, electric kettle and air conditioning. Rate: € 87.33 ... € 261.00; select dates below to get current rates. This twin room features air conditioning, electric kettle and tea/coffee maker. Rate: € 89.10 ... € 301.00; select dates below to get current rates.